THE rift between the Democratic Party (DP) presidential flag-bearer, Norbert Mao and the Mukono municipality Member of Parliament, Betty Nambooze, has widened. On Saturday Mao attacked Nambooze for supporting the Inter-Party Corporation (IPC) and independent candidates against DP candidates. Mao described Nambooze as an inconsistent legislator who keeps on changing her statements. Addressing a rally at Mukono taxi park, Mao accused Nambooze of presenting a list, while speaking on CBS radio, of people who have grabbed land in Buganda. He said Dr. Kiiza Besigye, the IPC flag-bearer, was one of them. “The same person who short-listed Besigye among the people who grabbed Kabaka’s land is again the one backing him! Nambooze has to be serious,” he said. “I talked to my sister Nambooze today morning on phone. I told her what she is doing is making us fools. We gave her the party flag for Mukono municipality parliamentary candidate. Why is she fighting DP candidates?” Mao asked. Mao said Nambooze has continuously campaigned against him as the DP presidential candidate and other party candidates, causing chaos in the party. “We treat everybody in DP equally. Althoug I am the party president, I am not bigger than any other member. How about Nambooze?” Mao asked. He advised Nambooze to stop singing that she was beaten and kidnapped to the extent of losing her life as she was fighting for DP, saying what she underwent is too minor compared to what people like Benedicto Kiwanuka experienced. 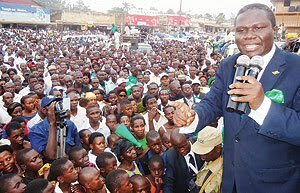 Mao asked voters in Buganda to stop tribalism if Uganda is to get a capable president. “Criticising me because I am an Acholi is not good. I am DP’s presidential candidate, not Acholi’s presidential candidate,” he said. Mao also attacked political candidates who put Kabaka’s picture on their posters, saying they are engaging the Kabaka into partisan politics. He said the Kabaka supports everybody in Buganda and Uganda at large. Mao warned Buganda on people who pretend to be too loyal to the Kabaka, saying they are opportunists. who will not be with in times of difficulty.